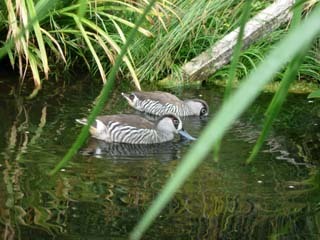 The Pink eared duck is endemic to Australia, occurring over much of the continent in suitable habitat, primarily being shallow lakes or slow moving water that is often associated with flooding. It only rarely occurs in coastal situations. Breeding in the wild as in captivity can occur at almost any time of the year, in the wild principal breeding takes place following heavy rainfall and floods. Rainfall is believed to be a primary precursor to breeding in the wild and may also be relevant in captivity, in captivity rainfall certainly triggers much excitement. The Pink eared duck sometimes referred to as the Zebra duck is a more challenging avicultural subject that remains rare and consequently expensive. They get their name from a small luminous pink patch just behind the eye, this is often not particularly conspicuous but when both males are females are in good breeding condition the patch 'ear, is very conspicuous and quite striking. In the wild Pink eared can nest in relatively close proximity to one another, from observations in captivity this always seems difficult to comprehend because the Pink eared is certainly a duck with attitude. They are a small teal sized bird that while not overly aggressive to other waterfowl will certainly not be pushed around. With other Pink eared they can be incredibly aggressive, they have a range of different calls and postures and if more than one pair is kept together there will be occasions when you will be amazed at the range off calls and postures a bird can make as they defend their patch of the enclosure. They are a very active duck and when in breeding condition they are either feeding or posturing and fighting with the neighbours. In the wild Pink eared obtain much of their food by filtering from the water with there very large shoveller like bills that on close inspection are far more fleshy than most other waterfowl bills, to the touch they feel and have the texture of the softest leather. They will spend hours filter feeding even if they are on artificial ponds where they are not really getting a great deal for their efforts, and if there happens to be a Daphne bloom then they are really in their element feeding on these. Pairs will be seen swimming across the pond with their bills just below the surface and they will suddenly swim in very tight circles, head to tail, with their bills turned into the centre of the circle creating a vortex with their feet that presumably brings small particles to the surface that they then filter out. Their basis diet is relatively straight forward, they will thrive on pellets and are particularly fond of the various floating pellets that they will either eat as designed from the water surface or quite happily take dry from a feeder. Pink eared are messy feeders, there are not many other waterfowl that make quite such a mess of the pellet bowls, they seem to add water to the pellets and if their feed bowl is near the water they will tend to turn the pellets onto soup. They also enjoy bread and probably also eat some wheat but their diet should primarily be considered to be pellets. Occasional meal worms are also relished but are certainly not essential to their well being. In the wild they apparently nest in a number of different situations and frequently use nesting platforms created by other waterbirds such as coots. In captivity thy will use a variety of nest boxes and have a slight preference for those that are actually over the water. Once a pair decide on a nest-box they will defend it with great gusto that is very amusing to watch. Clutches off quite pointed dull white eggs are relatively small and tend to range from four to eight with six being usual. The nest is lined with significant amounts of down that is quite different to most other waterfowl, it is very thick and has an almost sticky composition. Surprisingly for a bird that breeds in a relatively warm climate the Pink eared's down appears to have very exceptional insulating quantities. I you collect partly incubated eggs form your collection for artificial incubation keep a handful of Pink eared down for placing over the eggs until you are ready to place them in an incubator or under a broody, the down will conserve heat loss for a considerable period of time. If you ever have the need to transport partly incubated eggs place them in a bucket part filled with wheat to stop them moving around and then place a good handful of Pink eared down over the eggs and you can quite safely transport them for some hours without the need for a portable incubator. Pink eared eggs are relatively easy to incubate and hatch but then the challenge begins. Rearing them in a dry brooder would be ideal but this approach does not appear to work. Consequently they need to be reared with access to shallow water from day one. Feeding should initially take place on the water but trying to get the ducklings to take dry feed as quickly as possible. As ducklings they are incredibly messy feeders, one minute you can be looking at a cute fluffy little silver grey duckling and the next it has managed to completely smother itself in a gluey mess of wet crumb soup. Trying to clean them and stopping them from getting a chill at this stage can prove difficult. If this can be achieved then they grow and rear on in much the same way as any other waterfowl. Adult pair in breeding condition, note the obvious 'pink ear' that is not apparent when they are not in breeding condition. Pair not in breeding condition. Pink eared can cope with very hard weather conditions as long as there is some open water. They are the only species that I have seen with a significant build up of ice on their bill and tail and still they cope.